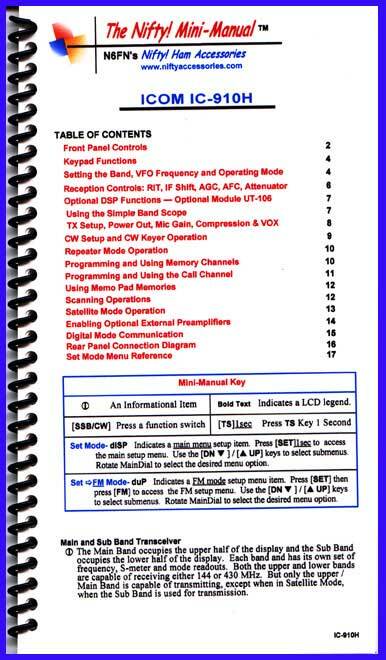 Compact IC-910 Mini-Manual. Size, 4.5x8 inches. Eighteen high-quality laminated pages, loaded with detailed instructions. Ideal for short-form manual for setting-up and operating this 2m / 440 satellite mode equipped radio. Provides clear descriptions for all controls, setup menus and modes of operation. Simple step-by-step instructions, augmented with useful hints and explanations. Indexed and organized for quick access to what you need by mode of operation. Color-coded, clear and easy to understand instructions that clarify operation. Smaller, faster and easier to use than the factory instruction manual. Laminated for durability and water resistance, great for GoKits. Compact: 4.5 x 8 inches, fits in a map pocket, small enough to be kept with the radio. Program your ham radio wherever you are at. An essential operating accessory! OUT OF STOCK. Product is discontinued and no longer available. Check our Discontinued Radio Guides for limited availability of discontinued products.